I’ve been riding different horses when I can, and last night I had a lesson on my friend Amy’s big Appy, Manny. This boy is darling and such a character, I just love him. He’s also a saint and I had a great time riding him – he’s much easier for me than Tucker. Riding these different horses is making me appreciate the feedback they offer to the rider who listens. All of them “tell on me” when I’m out of whack. Adding the fact that each has their own set of evasions and habits to the mix creates a real challenge for me as a rider. Manny has done a lot of everything, including dressage, but for the last few years, he’s been a hunter. His owner Amy is a lovely rider who can make this big boy move very nicely, so I knew that he had the goods, even if it takes some coaxing to get him to deliver. I put a dressage saddle of Christy’s on him and off we went. For Manny, last night’s lesson had to feel like a challenging yoga class. I asked him to remember his dressage training, come onto the bit, round and bend throughout his whole body. Manny made it clear that he preferred not to bend and instead offered to go around braced in a counter bend. Don’t WANT to bend! Manny was bracing in a counter bend (or trying to) for a lot of the ride. This was actually a great situation for me, because I don’t use my inside leg effectively enough. I’m happy to let it hang and imagine that I’m getting the response I desire. Copious video evidence suggests that this method doesn’t work. 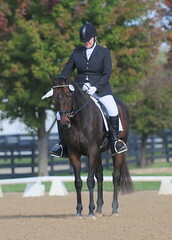 Christy had me work on spiral in/leg yield out and at the beginning it as a struggle. In addition to the the counter bend, Manny had a couple other evasions he threw at me constantly – popping his outside shoulder out, and when that didn’t work, cantering. We did quite a few inadvertent trot-canter transitions until I figured out how to regulate (and hold) the trot tempo with my seat. The spiraling worked, however, and as I got my act together, Manny came right to me. As I sat up and rode, the evasions lessened and he became focused and soft. I had to work to keep him there, but it’s easier to make minute corrections than to fix a braced neck. We finished up with some canter work, which was easy and fun. I loved riding Manny, because he let me work on myself. Riding Tucker is a different story. I find him devilishly hard to ride, which is probably a combination of his fancy gaits, short wheelbase, substantial training and responsiveness. Tucker reveals and amplifies mistakes I make. He requires his rider to have their act together. He’s a real challenge for me. Come hell or high water, I’m really determined to ride him will some day. In other news, I’ve had to resort to some chemical help for Derby, as we go into our third week of stall rest. He’s starting to exhibit his pent-up energy when we’re handwalking, so I asked his vet for some help. She left us a big bottle of Ace, which is doing the trick nicely. The ring is getting crowded and from a safety standpoint, I can’t have a Thoroughbred kite on the end of my lead rope when we walk. He is going to be re-scoped on Dec. 10, and will be hopefully cleared for turnout that same day. Fingers crossed!